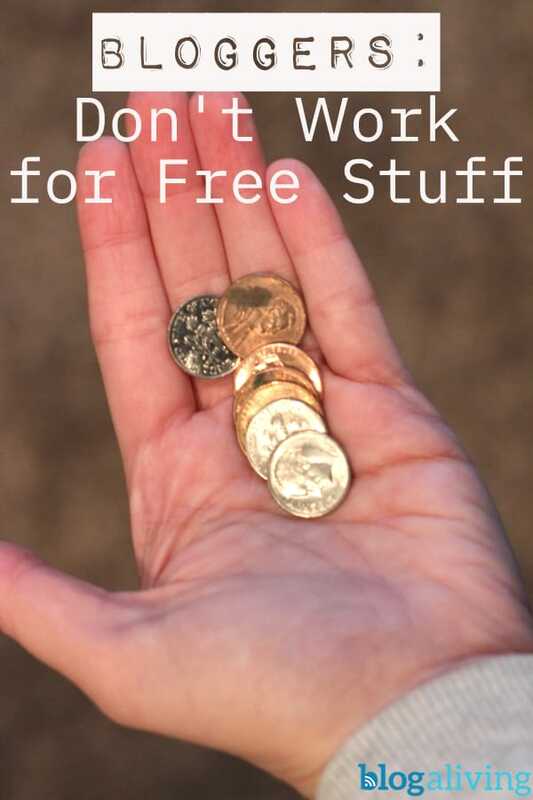 If you’re a blogger, you’ll be asked to work for free. Companies will ask you to review sample products. You’ll be invited to run press releases. Here’s why you should turn almost all of it down. Once upon a time, a professional hula hoop performer told the story of being asked to perform at a $1000/plate event for Oprah Winfrey for free. The producers suggested that the exposure would be well worth her time and expenses in performing. But if she’d already gotten enough exposure to come to the attention of Oprah Winfrey’s people, more exposure was the last thing she needed. All the exposure she worked for was netting her $0. Therefore her career as a hula hoop performer was worth $0, so she gave up and found herself a more ordinary job. Companies will offer you the chance to do hours of work for them in exchange for a mention from their social media. Measure your time spent by a reasonable hourly rate. Is this mention likely to bring enough traffic to pay for itself? In traditional media, say television, a brand can lend a daytime show a patio set (for example) for an outdoor segment. The television show gets a new scene to shoot, the brand gets mentioned by the host (and in the end credits) and they get the patio set back after the show. No money or product exchanged. But plenty of eyeballs on the brand’s stuff. But this concept “falls apart” when it comes to bloggers because free content don’t really help us. Very few blog readers want to read press releases, and Google considers them duplicate content. In most cases, we do just as much work on “free content” provided by a company as we do on our own fresh, original content. And yet, we think we should do these projects because we’re building a relationship with a brand, right? But the relationship we’re building works a lot like the hula hooper’s experience with Oprah: it’s all about what you can do for the brand and not what the brand can do for you. When brands approach me to promote them for free, I politely decline unless their offer benefits me, too. Let’s say you’re a gardening blogger and you’ve talked about a particularly stubborn weed you can’t get rid of. A brand offers to send you a revolutionary product to help with it, and you like the sound of the product. In this case, you might benefit from giving an honest review of the product, along with an affiliate link for your readers to buy it. That is, if the brand wants an honest review. I’m finding more and more demand positive reviews. Which means you’re just writing their glowing press releases for them. Brands need to realize that they must fit in with us and deliver us something we can use either with minimal effort or maximum benefit. We do not exist to provide them something for nothing. Don’t you need brands to like you? Am I afraid of upsetting brands with this talk? Not at all. I make my money with display ads, affiliate sales, and I’m working on some products to sell (courses and/or ebooks). I don’t do sponsored posts and I don’t care if I ever hear from another brand. And I don’t recommend sponsored posts as much of a business model because targeting keywords and affiliate opportunities brings in more revenue in the end. But even if you want to do sponsored posts, it’s important to establish yourself as someone who won’t just be used. If a brand thinks a performer who’s had enough exposure to come to the attention of Oprah’s people can be bribed to perform for “exposure”, they are not even on a nodding acquaintance with reality. I’d rather work with brands who get the concept of “quid pro quo.” On my other sites, I get approaches from small companies who seem to get this – they customize their approach to actually be of use to me, and often get it right. I also get approaches from companies both small and large who think they can hand me a press kit and I’ll take over from there, providing them with targeted traffic in exchange for… a press kit. Wow. Thanks. When brands ask you to work for free, have a pre-written email to send them. In that email, point them to your pricing for sponsored posts, if you do sponsored posts, and any rules you have (for example, no guarantee of a positive review). If you don’t do sponsored posts, you can write back explaining that or just ignore the email. The point is to let them know they can’t get something for nothing. The more of us who do this, the more brands will realize they’ve got to pay like everybody else.